Kim Tak-gu is the eldest son of Gu Il Jong, the chairman of Geosung Foods Enterprise, a legend in the baking industry. 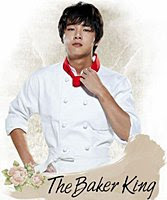 Although he is an extremely talented baker and seemed destined to succeed his father as president, Gu Il Jong's family plotted to rob him of his inheritance because he was born to Il Jong's mistress. Takgu's determination to become number one in the baking industry drives him to rebuild his career from scratch despite the many trials he faces.